Mysterious disappearance of flight MH370 and incursion of Sabah waters, up north of Borneo by rogue terrorists – at first glance, these events seem to be isolated from each other. But were they so? One thing for sure we were definitely caught off-guard, given the fact most of the signals were either lost within the noises or truncated during the transmissions – even before the events materialized. Domestically, our leaders are busied and chained to the political jeopardy of post-GE 14th largely due to the deprivation of two-third majority in Parliament. As result of this, the incumbent leaders face serious constraints in matters pertaining to crafting new policies as well as with its implementation – just look at the manner recently approved Goods and Services Tax (GST) bill being communicated and cascaded down to the people at large. Truly these fiascos are and will continue sapping away the energy of our leaders and skewing their attention from larger concerns. Such unfortunate scenarios have left our government specifically, and our country generally, to be much more vulnerable towards geopolitical risks as mentioned before. Again why such unfortunate events seem gravitated towards Malaysia? The answer is of course, lies in the buzzword that dominates the International Relations (IR) fraternity called “the pivot”. Pivot in literal sense means “that on which anything turns; a cardinal or central point”. Appropriated into a technical term in IR, it denotes and is referred as the geopolitical fulcrum that holds the key to leadership and control of a particular regional and territorial of influence through strategic foreign policy moves. Recently the term gained currency from an op-ed entitled ‘America’s Pacific Century’ penned by former US Secretary of State, Hillary Clinton which appeared in the influential IR journal, Foreign Policy in the late 2011. The gist of that piece is basically about the renewal of intent in US foreign policy to be the major player in the Pacific Rim – an area that has been long neglected since the day of US Imperial excursion to Middle East under the banner of “War on Terror”. It all changed recently after the world took notice on the rise of China in world economy. Much has been written about the tussle between China and US with respect to their rivalries in asserting ‘soft power’ in the Asia Pacific generally, and South East Asia primarily. Most glaring example is through the US-led Trans-Pacific Partnership Agreement (TPPA). Despite China is not party in TPPA, she is still regarded by many geopolitical and international trade analysts to be the real “elephant in the room” as part of US containment strategy against China’s growing dominance in the region. Recent events on South China Sea’s territorial dispute in which China is seen to be an ‘aggressor’ by her neighbors have rekindled the nationalist sentiment among ASEAN countries. For example, hatred against China is all-time high in Vietnam where one could see how the Vietnamese vented their anger on the street and violent backlash towards China’s business investments in Vietnam have gone berserk when state-owned China National Offshore Oil Corporation (CNOOC) deployed an oil rig in a patch of disputed territory 150 miles from Vietnam's coast near the Paracel Islands, which are claimed by both countries. The recent visit of President Obama to the Philippines was greeted by a large number of Anti-US protest throughout the country in which one of main reasons was due to the re-establishment of US naval base in Philippines – that was originally shut down in early 90s – by signing a 10-year Enhanced Defence Cooperation Agreement between Washington and Manila. Notwithstanding the relative economic prosperity of ASEAN countries, the region is undergoing some tumultuous changes – as portray in the ongoing national election in Indonesia and the impasse of Thailand domestic politics, one could not but to think hypothetically as if things are slowly unfolded by design. So where is Malaysia in these scuffles? Are we just a spectator in the midst of this brawl of nations? Can our current foreign policy’s position be considered safe and insulated from this regional conflict? Will Malaysia receive an unintended impact as vividly described in a Malay proverb “Gajah sama gajah berjuang, pelanduk mati ditengah-tengah” (when two elephants fight, the mouse deer in between is trampled to death)? This is not a conjecture. 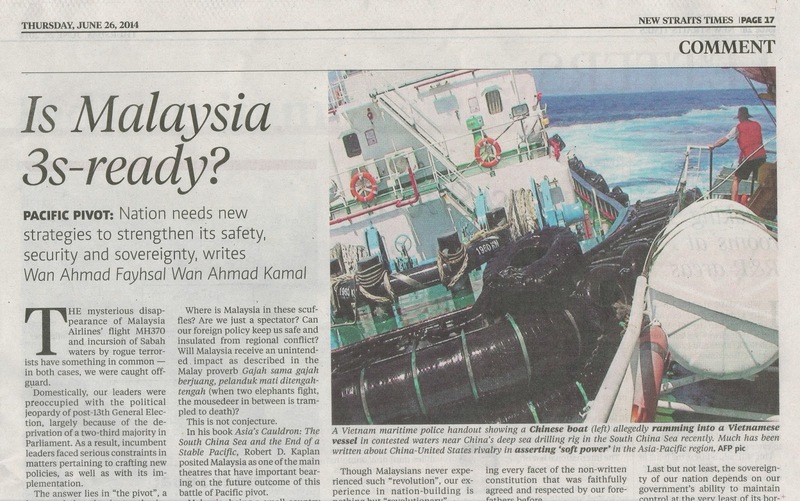 In his latest book “Asian’s Cauldron: The South China Sea and the End of A Stable Pacific” – respectable itinerant journalist Robert D. Kaplan clearly posited Malaysia as one of the main theaters that has important bearing on the future outcome of this battle of Pacific pivot. 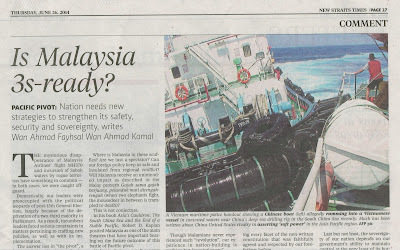 In difficult time like this more often than not, Malaysia being a small country sandwiched between the rise of Eastern Dragon – China, and the excursion of Pacific Poseidon – the United States of America, is in need for the almost impossible panacea that could guarantee her the “Three S” (3S): Safety, Security and Sovereignty. Recent racial and religious tensions that were amplified on daily basis in the mass media have rekindled slew of debates with regard to some of the most sensitive issues pertaining to the nationhood of our country. Such debates warrant us to revert back to the basis of the founding of this nascent nation: the constitution. The most fundamental element within our Federal Constitution that was forged from that made us possible to be a nation-state called Federal States of Malaya and subsequently later as Malaysia in 1963 – up to this very day is the guarantee of safety for all races that have been legally accepted before the law to be the citizen of this country, as stipulated in Article 5 of our Federal Constitution. Despite the dark patch of 13th May 1969, Malaysia is relatively free from civil, racial, and religious war that used to colour the history of some of the most advanced nations on earth. For them to be a nation that continues to exist and flourish till today, they had to undergo tumultuous struggle against their own people, races, and religions. Their historians have no qualms to term such events as “revolution” and accepted it as part of the formative process in a journey towards nationhood that warrants a great deal of sacrifices. Unfortunately in these episodes, religion has become the sacrificial lamb for the sake of creating a more just, stable and secular future – novus ordo seclorum – a motto that appears on the reverse side of the Great Seal of the United States of America and widely printed on its dollar bill, the currency of international trade and commerce. Though Malaysians never experience such “revolution”, our experience in nation-building is nothing but “revolutionary”. There has never been a majority Muslim nation post-Ottoman empire that has governed three major races and dozens of religious affiliations – in which all of the races and religious affiliations do not share the same historical experience and destinies – as successfully as Malaysia. This is a real manifestation of the success of what the former Prime Minister of Malaysia, Tun Dr. Mahathir called the spirit of “kongsi” or “muafakat” – Malay concepts which can roughly be rendered into English as “benevolent sharing and cooperation” – a spirit that is so evident at all strata of Malaysian society. But now such notion is being challenged by some of tectonic changes in world politics. The rise of political liberalism that preached equality instead of equity, and secular human rights in lieu of religious virtues and duties have engulfed not only the pariah states in Middle East, Africa but also in the developed Western countries. It is an open secret that the drive for political liberalism is not so much coming from the political ingenuity of the masses alone, but it is socially engineered via “colored revolutions” through the means of systematic training, funding and empowerment of grassroots civil society movements assisted by foreign organizations that have geostrategic interest within our region. They usually capitalized upon governments’ mistakes and inefficiencies to galvanize mass political movement that demands reform that is beyond the norm of local value and belief system, challenging every facets of the non-written constitution that was faithfully agreed and respected by our forefathers before. Such activities are directly challenging the very notion of Safety in our journey of nation-building as the movement will definitely snowballed into a political movement that will rip our nation apart as by design, it will pit two confronting and equally powerful group of people in the form of “New Order of Ketuanan Rakyat” against the “Ancien Régime” of Malaysian politics. Security exists primarily because of threat. 21st century security issues are not restricted to the classical notions of espionage or territorial breach. The advent of modern network society and the fast pace of Schumpeterian “creative destruction” economy have widen the scope of espionage where the stealing of state secrets are no longer exclusively in the domain of politics but also trade and commerce. John Perkins’s Confessions of An Economic Hitman, Naomi Klein’s The Shock Doctrine and Jeremy Scahil’s Dirty Wars portrayed some crucial examples that security matters today are one convoluted subject that challenges the very basis of Westphalian statecraft where everyone lives on the periphery of the system – except the superpowers. Malaysia, being a neighbour to the second-most militarized state on earth after Israel has everything to worry about the waning influence of the 1971 declaration Zone of Peace, Freedom and Neutrality (ZOPFAN). The increase presence of China and United States through various economic and military channels – as indicated earlier by TPPA, dispute of Islands in South China Sea and the greater access to naval and air bases granted to America by Philippines – should serve Malaysia as a stark reminder that uncertainties and stability that ZOPFAN has offered is expiring faster than we can estimate of. Last but not least, the most important of all, the sovereignty of our nation depends on the ability of our government to maintain control at the very least of its borders: air, land and sea. Any illegal excursions and trespassing into our territory – even for an inch – is tantamount to be an act of aggression. In these few years back we not only saw numerous attempts by foreign countries “accidentally” digressed into our waters but also losing few strategic site, case in point the so-called terra nullius of Pulau Batu Puteh as claimed by Singapore. Despite of it is being just a small plots of rocks, Pedra Branca – as it is known in Portuguese – is both an important symbol as well as a reality that really demarcates our sovereignty and authority down south. Losing it is a real blow to our maruah (honour and dignity) as a sovereign nation, for failing to preempt and safeguarding our line of sovereignty in the international arena. We must reestablish new strategies for our 3S. The old formulas have served its purpose and made what we are today. If Turkey is repositioning itself as regional power in the Mediterranean through its Strategik Derinlik (strategic depth) as framework of their proactive-form of 3S, then Malaysia, which straddles along one of the most important geopolitical chokepoints in the world – the Strait of Malacca – surely requires something of the same effect. In the cause of erecting formidable defense and absorption system against unforeseen geopolitical impact, our government must ask – what is our Risk Appetite and how far are we willing to go to buy more “concession” of time and space that cannot necessarily be translated into opportunities, what more ability to secure our 3S? In traditional folklore the pelanduk has been lauded to be a small yet smart creature that brought the establishment of one of the greatest ever-Muslim empire in this region – the Sultanate of Malacca. Perhaps the present and future leadership of our country could still emulate the same feat of that brave and cunning pelanduk albeit the challenge is far greater in this new “Great Game” of 21st century.